Visual Interfaces for Mobiles @ NCSU: Find: he State of Smartphones in 2013, Part II: Would you like to play a game? 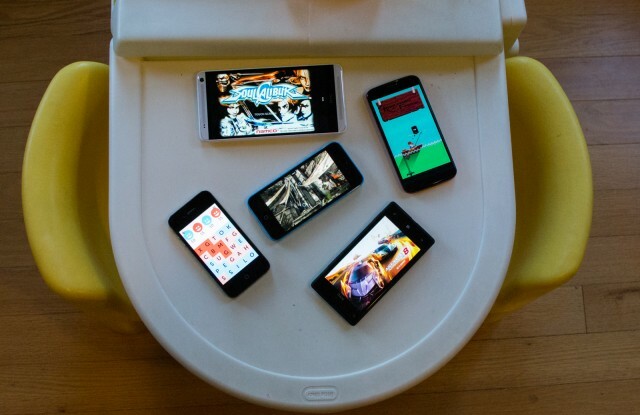 Find: he State of Smartphones in 2013, Part II: Would you like to play a game? The old rule for cameras applies to games: the best console is the one you have with you. We play games while we're on the bus. We play them while sitting in waiting rooms and standing in line. We play while our kids cover the walls in snot and crayon. We play whenever and wherever we can, and we've come a long way from playing Snake on our Nokia candy bars. Google, Apple, and Microsoft have built services to extend the capabilities of their platforms for gaming, so silicon vendors in turn have pushed graphics hardware to startling heights. In 2012, the number of us playing games on our phones exceed 100 million, and we're likely to clear 120 million this year. This industry is generating real dollars, with revenues expected to be well over a billion this year. But growth aside, just what are the major themes of mobile gaming over the last year? Ecosystem remains king, even in gaming. When it comes to game distribution and development, the services offered by the major vendors are hugely important. As mobile gaming matures, players want access to achievements, matching, and cloud saves. Putting that information on centralized servers allows gamers to know that when they buy a new phone or pick up their tablet, their Angry Birds scores will still be there.